Facebook recently changed its policy on cover images for business pages. The 20 percent text overlay rule is still in effect, but other restrictions have been dismissed. 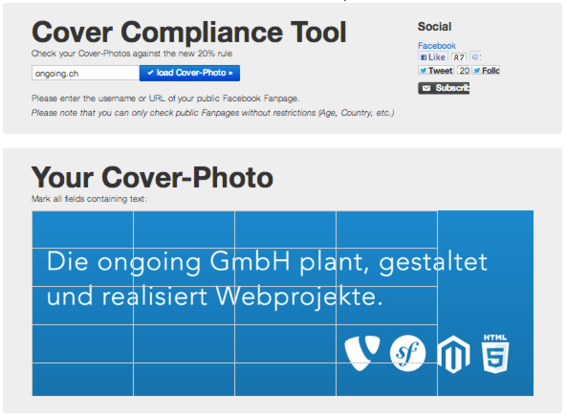 A web developer in Germany has created a cover photo compliance tool that page owners can use to determine if text included in an image follows the guidelines. To use the tool, simply input your Facebook page URL and select the areas that contain text. Here is an example of the Practical Ecommerce cover image, which the tool determined contains 16 percent text. Practical Ecommerce cover contains 16 percent text. Under the previous guidelines, cover images could be used mainly for branding purposes. The new guidelines open the door to almost unlimited creativity for merchants who wish to use them for sales and marketing. Here are 10 ideas to consider. Use a unique image that represents your business. This could be a photo of consumers using your product, a special sales promotion, or image representing a seasonal emphasis. Test different images to see how fans and page visitors respond. Add contact information. Consider website URL, email address, or phone number. Use Facebook social actions. This could include “Like” or “Share.” You might want to include an arrow pointing to the “Like” button on your page. Place references to other social networks. This could include icons to Twitter, Pinterest, or LinkedIn along with URLs for those sites. This example, from Facebook app provider ShortStack, encourages users to follow the company on Twitter. ShortStack’s cover points Fans to its Twitter page. Emphasize an app. Direct users to a custom apps, such as those provided by third parties like North Social andOfferpop. Include information about a product along with its URL. Use a URL shortener such as Bit.ly if the address is too long to be easily typed by the user. Cover photos do not allow for active hyperlinks — in other words users cannot click the cover image to be taken to a product page — so they will have to type the address. The shorter the address, the more likely they are to take action. Use the cover to generate leads. For example, HubSpot used the following cover image to encourage people to download an ebook. Users were required to complete a form first. HubSpot used its cover to generate leads. Change images occasionally. This keeps your page fresh and gives users reasons to return. Cover images can now directly serve sales and marketing functions. Think of them like you would a display ad or billboard. Use these 10 ideas for inspiration.